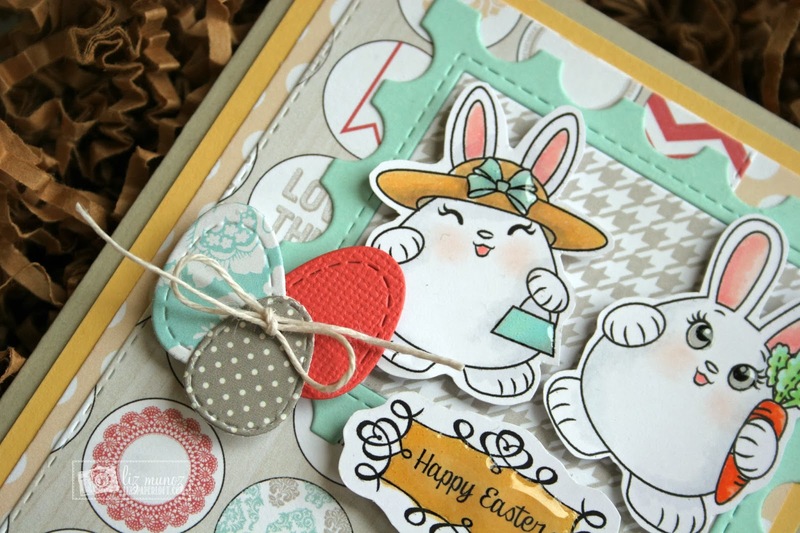 Liz's Paper Loft: Peachy Keen March Release ~ Happy Easter! March has officially arrived, and with it, the promise of Spring just right around the corner. 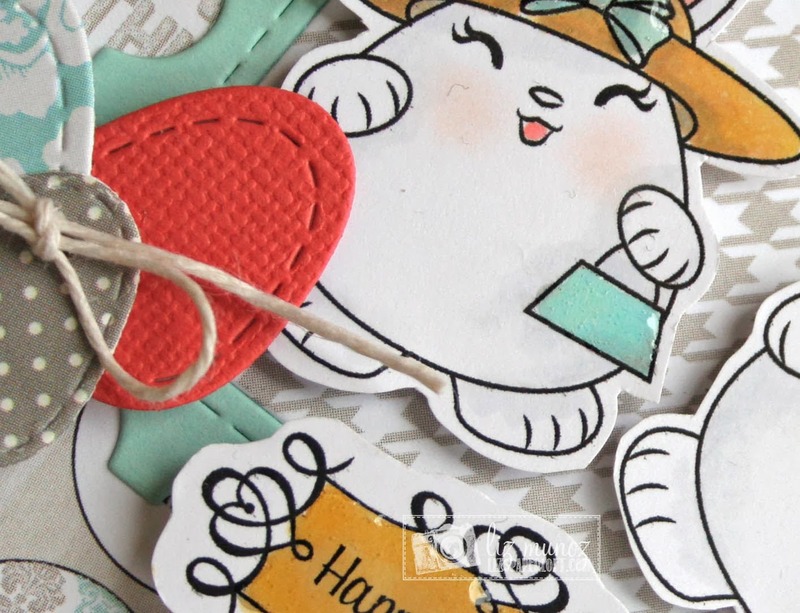 The March Release at Peachy Keen Stamps has got Spring covered with some adorable traditional Springtime images to warm your heart and make you smile, and you’ll even find there’s love in the air with this release! We can hardly wait for you to “chick out” each and every stamp set for this month! 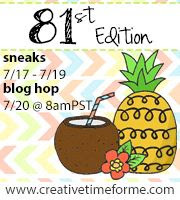 Join us each evening at 6:00 p.m. CST the 1st through the 4th of March for sneak peeks of specific stamp sets, and then on Wednesday, March 5th, plan to take part in our Release and Reveal Blog Hop! Today, we are sharing project samples using PKSC-27 March 2014 Stamp of the Month. Are you a member of the Stamp of the month? If not, then you are missing out!! 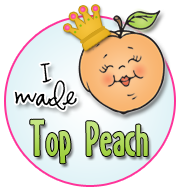 Find out about how to become a member and enjoy all the perks from being one of the first ones to see and receive the new set each month to exclusive savings for purchases in the Peachy Keen Stamps Store throughout the month for MEMBERS ONLY! Follow the link below for ALL the details! Aren't these the sweetest bunnies! I think they are ADORABLE!!!! How would you like a chance to win the stamp set you see showcased here today? One lucky person who visits each of our designer’s blogs and leaves a comment will be drawn to win the stamp set we’re sharing today. 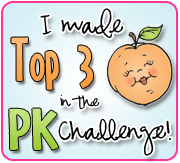 The winner from today will be announced on the PKS Blog in tomorrow’s post, so you’ve only got today to enter for your chance to win. 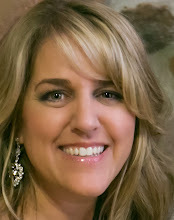 Be sure to take a peek at what my Design Teammates have created! The glossy accents are a perfect touch! Such a cute card! Thank you for sharing. So cute. Love the bunnies with the Easter flare. Those bunnies are so cute. Love the paper and that big banner!!! those bunny stamps are to die for!!! I love your card,it's so precious!!! Soooo cute! Love your card and can't wait to get my bunnies! What a cute couple. Love the card Liz!!! Your card is darling! The chubby Easter bunnies are so darn adorable! Love the mix of papers to! Cute little bunnies. Really like your card. OH MY WORD!! This card is just way too adorable! I am loving those bunnies! Her cute little face just put a smile on mine. Great job my friend! AWW They are so Adorable and the Glossy Accents you added to the eyes it's perfect. Liz ~ this is so CUTE, ADORBS, BEAUTIFUL and WHIMSICAL all at the same time to me! AMAZING as always! What a cute card! I can't wait to get my hands on those bunnies! 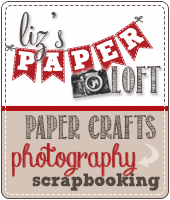 Liz everything from the papers you picked to the way you colored the stamps is perfect! I love all the elements you added. Those dies go perfect with this card. Thanks for sharing! 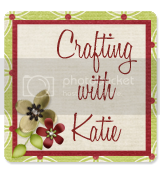 Your card is super adorable! Those bunnies are so cute and I love how you colored them! Adorable! I love the layering. Sorry, commenting from my phone!!! I was trying to say how cute! darling card. 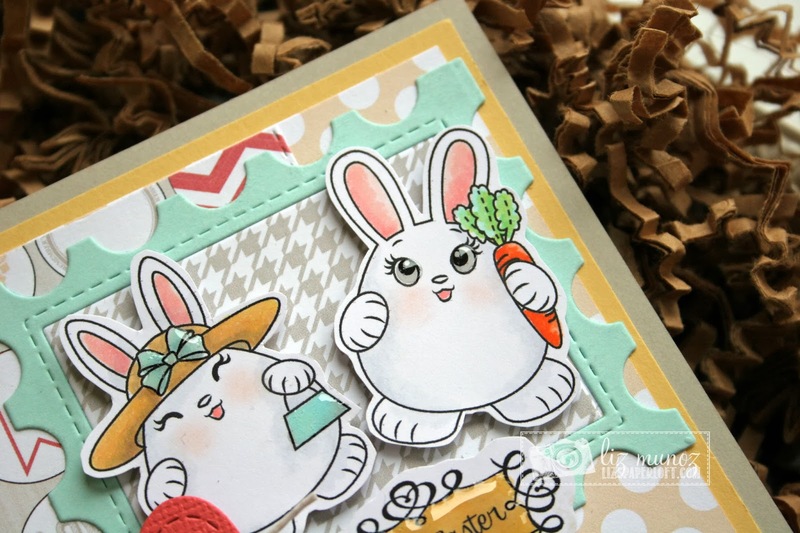 Love all of the elements highlighting those cute rabbits. Great job. What a cutie patootie bunny couple!!! I just love them Liz! Great job today...love the colors and papers too! I love all the accents. Those die cut eggs are just too cute. So cute,, I love the paper you used! These bunnies just make me smile! So adorable, Liz! Having a love affair with these super cute bunnies....love them to pieces! Such adorable cards! 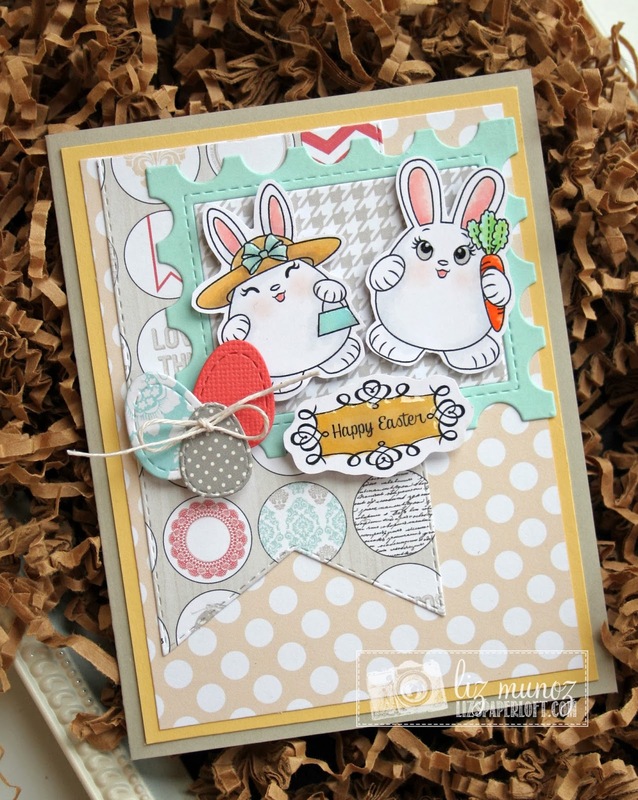 Such fun layering and like the stamp design with the cut rabbits. 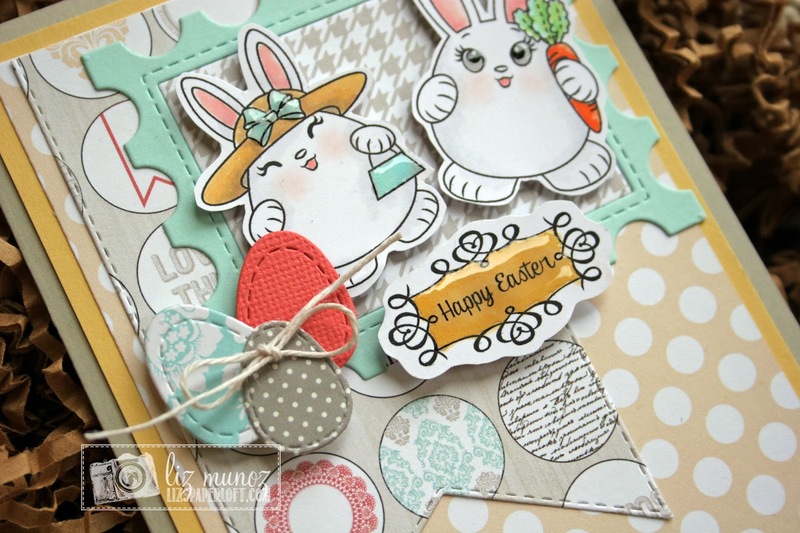 I just love these bunnies, so cheerful and sweet, love the little eggs too, great card! Totally adorable little Easter card!!! Love the glossy accent you have added to the images. Awesome card! The bunnies are too adorable! I love the layout with the postage and fishtail banner layers, but I especially love the glaze you added on the sentiment. I just love your card it is absolutely darling!! I love this...the papers are great and those faces are super adorable. Super cute card. Those bunnies are so adorable, love the hat. Pretty papers also. This is way too cute!!! Hugs!! Cute card.I love those bunnies!! 0824jejeLa semelle basket enfants nike prsto noir garon affiche des tensions modernes et lisses avec une disposition de couleur noire / rouge chaussures tn nike femme / argentée froide, même si la finition noir doux très facile sur la asics gel lyte 3 femme citadium couronne en forme de poire fournit une adresse de vérification air jordan 1 retro homme conventionnelle. Rondo et Westbrook PE, Kay Yow Suppose Rose, Complet debardeur asics france Orange, Sport Cramoisi, Bleu Trésors, Marine de Minuit, Béni Inexpérimenté, Del basket adidas femme zx 700 Sol, Club Purple, Blanc Chanceux Écologique, Blanc Treasure Bleu, Blanc adidas zx 750 gris Activité Violet, Blanc Intéressant Gris et Blackout. L'espoir, c'est que lorsque nike air jordan 7 homme le reste du marché va dans une seule direction, si Nike air jordan 10 retro Shox Deliver seul va dans un autre, il les différenciera de la asics blanche solde meute.